I wasn't going to blog today but as I have a post to put on from JEM (yes she still is alive- don't worry), I thought I would share with you my new Topshop buys. Now I was going to photograph them for you but I am far too lazy to move from my bed where it is lovely and warm, so you will have to make do with pretty pictures from the Topshop website. Plus considering the amount of clothes I buy (or used to- you'll see why later) I don't understand why I never blog about it... this is going to change. Now throughout December I had a "no spending money on clothes until Boxing Day ban", which I kinda did stick too... well thats a lie, I was after a Micky Mouse sweatshirt from Primark which I couldn't find, so ended up buying another sweatshirt and then bought the Micky one when I found it in Newcastle... however... I did return the other sweater and changed it for a sheer shirt (it was after boxing day so its allowed). Quite good for me cause I would normally have kept the sweater and buy the shirt. So on New Years Eve and considering my 200 quid budget a month from 1st January for clothes, going out etc, one last Topshop splurge before it kicked in is ok isn't it?? Plus I did return some sale items too... shock horror which I decided I didn't really need (extra 40 quid for me). I think I'm at that stage now where I need to take account of what clothes I have and what items I need to add to my wardrobe. Plus as its my Birthday night out on the 22nd (oh how I wish I was 22- yes I am still having issues about my age) I wanted something new to wear. You have to have something new to wear on your birthday night out... its the law. 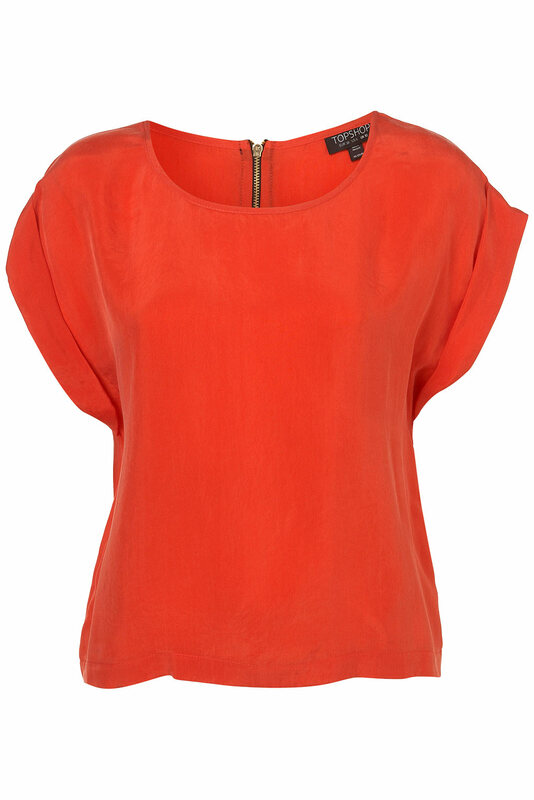 Zipped back tee- ₤15 (sale). The tag says its supposed to be red, however it looks more Orange. Love this top, would actually pay full price for it as its one of those dressy, but not too dressy tops (if that makes sense). I have been eyeing these babies up since they first came out however I wasn't sure on spending so much money on a pair of boots which is going to make me 10" taller than everyone around me. However for some reason my feet are funny sizes in Topshop- size 8 boots are too small, yet size 9 slip ons are far too big. However considering in the shop this was the last pair and in a size 9 I think it was a sign to buy them. Now I just need to master walking in shoes with such a big platform (I'm not used to them) before next week. 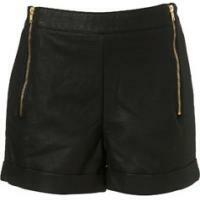 Finally, PU Leather shorts ₤38. One of my New Years Resoultions is to try and stop wearing dresses every time I go on a night out. I need to wear other items of clothes haha. So for my birthday night out I am wearing these bad boys aka my lederhosen as I've been calling them with my lovely new shoe boots. Quite looking forward to wearing them, but really apprehensive at the same time. Even though I wear short dresses I have no problems in my legs being on show, however I am worried about being called thunder thighs in these shorts. The diet is back in full swing for next week as I'm now paranoid I wont fit in them haha. you are a braver woman than I with leather shorts...I live in shorts, I love my deinim ones but no sure I could pull of leather ones, also I would wory about getting them back on a'la Ross in friends! I love them booties they gorgeous and although i could do wiht being 10" taller i would never in a million years be able to walk in them! I'm sure I'll be sober enough to catch you when you fall. We're going to have to nominate someone taller to go down the stairs first tho, I don't want to be in a human-domino situation. I love the shorts, especially the zip detailing. Good on you for managing to take clothes back, usually I just give stuff I don't like or that doesn't fit to my sister.